Finely chop one medium sized onion. Gently fry in 1 tablespoon of East End Sunflower Oil until golden brown. Drain contents of can and mix with salt, East End Garam Masala and chopped ginger to taste. Add the spinach mix to the fried onions, cover and simmer over a medium heat for at least 20 minutes, stirring occasionally. Meanwhile, cube paneer and fry gently in East End Vegetable Oil until golden brown. 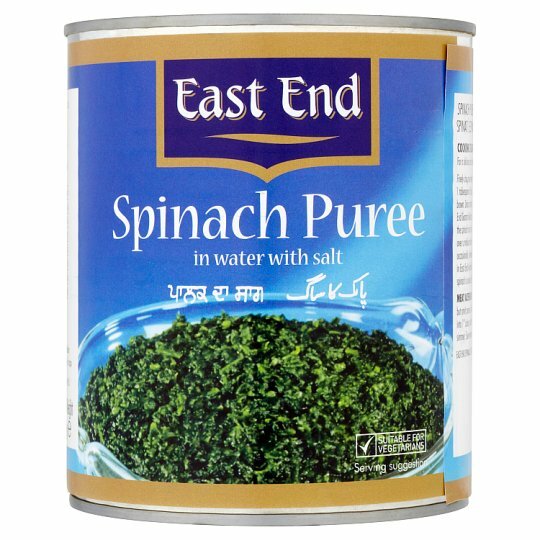 When spinach is cooked, add paneer and serve. Prepare spinach as above but omit paneer. Dice boneless meat of your choice into 1" cubes, add to spinach mix and continue to simmer. Serve when meat is tender.